Thank you for spending time with us. We have a long history of serving our customers and we are proud to continue to serve you everyday. If you need help in an emergency or transportation give us a call. We can help with a variety of truck, vehicle or equipment related challenges. Our rates are competitive and our response is immediate and professional. 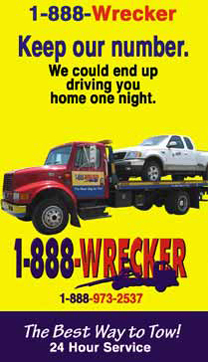 Whatever is the unit big or small we tow them all and you will recieve the same friendly, competent service when you call 1-888-wrecker.